Plateau Restoration was founded in 1995 to enlighten, inspire and involve the public in the long-term care of landscapes of the Colorado Plateau through service and science-based learning adventures. We focus on building a connection with nature and encouraging the spread of stewardship. We raise funds through memberships, donations, grants and services we provide. Members of the public can learn more about the natural and cultural history of the area while helping support our mission by signing up for a land and/or river-based Conservation Adventure volunteer or corporate team-building program or GeoTour educational program. We also provide natural resource education to the broader community through workshops. You can help by contributing to the organization, sharing in an adventure and/or spreading the word. is an agriculturally-based 501(c)3 tax-exempt non-profit organization, founded in 1995.
conducts professionally-led service-projects to restore ecosystem health to damaged lands. provides environmental consulting, water-wise natural landscaping on private lands. 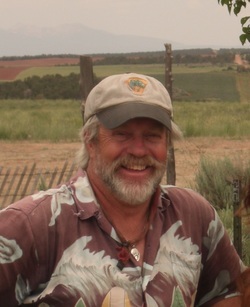 Plateau Restoration’s Founder and Board President, Michael has lived on the Colorado Plateau since 1976 and in Moab since 1989. His love for the Plateau was ingrained while working at Phantom Ranch in the bottom of the Grand Canyon in the mid-70’s. He later earned degrees in Outdoor Education and Recreation Management from Colorado Mountain College and in Outdoor Recreation and Resource Management from Prescott College, Arizona. He worked as a National Park Service Ranger in visitor and resource protection and interpretation at Arches, Canyonlands, Natural Bridges, and Dinosaur National Parks and Monuments, and has guided for numerous outfitters including OARS at the Grand Canyon and Canyonlands Field Institute in Moab, UT. 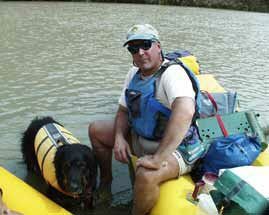 Michael was Manager of Sand Flats Recreation Area, Moab, home of the famous Slickrock Bike Trail from 1998 to 2004. He is also a Master Gardner. A native of Zimbabwe, Tamsin has lived in the Four Corners states of the US since 1977. She holds Bachelor’s, Master’s and PhD degrees in Geology, and has been teaching college courses in geology on the Colorado Plateau since 1993. 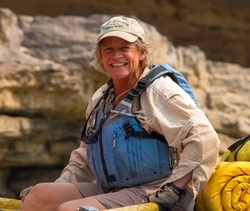 She has served as a naturalist guide on river and land-based trips since 1994 and conducts geology excursions for Plateau Restoration and the Moab River Rendezvous. She joined Plateau Restoration as a Board Member in 1996 and is currently the organization’s Executive Director. Tamsin has held Adjunct Faculty appointments at Utah State University in the Department of Environment and Society and Department of Wildlife Resources. On August 30, 2013 we lost our wonderful friend of 38 years and long term board member, Leif Johnson. Michael met Leif in the mid- 70’s on the South Rim at Grand Canyon. It only took a couple of weeks before they developed a strong friendship built through a love for the great outdoors especially the canyons and rivers of the Colorado Plateau. As best friends, Canyon brothers, they went on trip after trip over the years. Leif was an inspiration when it came to enjoying yourself and the friendships that you can have in the course of your lifetime. His favorite quote was, ”take care of your friends, they are all you have.” Leif was not only a important friend but also a dedicated supporter of wild places, wildlife and, as a board member, a strong supporter of the work of Plateau Restoration. Leif, we cannot thank you enough for all the great times together and the true love and friendship that you brought to our lives. We think of you each day and miss your booming voice, warm hugs, loud music and big smile. Meet you down stream. LOVE YA, MAN!!! Leif Johnson Memorial Fund – How Can I Help? Click Here.